TORONTO (Apr. 10) — Though I was very–likely the first local observer to write (on Jan. 28) that Mike Babcock needs an opening–round playoff victory to ensure he remains as coach of the Toronto Maple Leafs, the animus toward Babcock grew beyond reason when the club foundered late in the regular schedule. Such commentary as “he’s lost the ear of the players” and “he’s taken this team as far as he can” became prevalent on Leafs–related websites — provoked, in large part, by the mainstream Toronto media also contemplating the necessity of a first–round triumph. The latter position escalated when Babcock appeared to censure rookie general manager Kyle Dubas with public remarks about the club’s lack of depth and inability to withstand injury to Top 4 defensemen Jake Gardiner and Travis Dermott. The general interpretation: Dubas wants to name his own head coach and Babcock had best provide him reason not to. The “what–have–you–done–for–us–lately” posture began to flourish when the Maple Leafs lost an array of late–season matches to such–inferior clubs as Arizona, Vancouver, Chicago, Ottawa, Philadelphia and the New York Rangers — thereby forsaking any chance to overhaul Boston for second place in the Atlantic Division. Fans that were strung out on Dopamine the afternoon (May 21, 2015) that Babcock signed as coach of the Leafs were now calling for his neck. Which, though very Toronto–like, was rather over–the–top. Saskatoon–Mike may or may not return for a fifth season behind the Leafs bench, but he hasn’t become a clod. 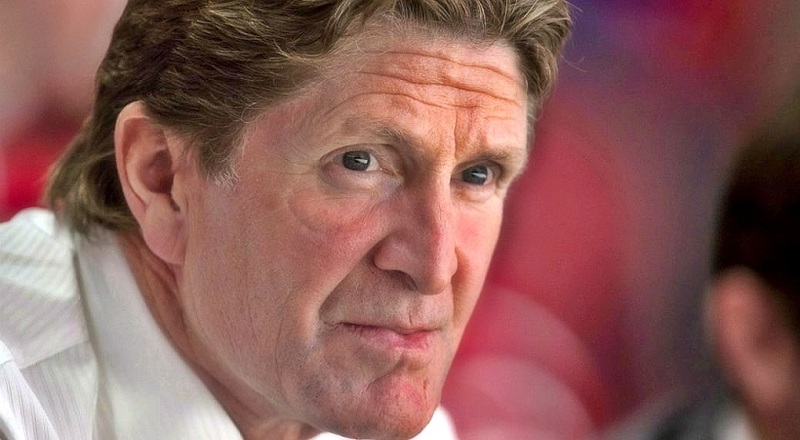 He’s the same Mike Babcock that won a Stanley Cup with Detroit in 2008; followed with Winter Olympic gold medals on behalf of Canada in 2010 (Vancouver) and 2014 (Sochi), then added a World Cup tournament title in 2016 (at the Air Canada Centre). Nor has he been diagnosed with any form of frontal–lobe deficiency. So, perhaps we should temper the Babcock narrative until at least the puck is dropped in Boston on Thursday night. If the Maple Leafs provide the Bruins a stern, honest test — or, as I’ve predicted, actually win the Division semifinal — there will be no pretext for which to dump the veteran coach. Dubas will have to wait for something grievous to befall the club before justifiably pulling the plug: either a playoff rout by the Bruins or an interminable skid sometime next season. Neither of which seems likely. Prudence would also suggest a more–viable candidate to guide the Leafs. Though Sheldon Keefe may be a burgeoning flavor for Dubas, the Marlies coach, when last I checked, trails Babcock 691–0 in National Hockey League wins. As with Gardiner’s absence late in the schedule, we often don’t appreciate something until it’s no–longer in place. As such, I reiterate: a victory over Boston in the playoffs would absolutely assure a fifth season behind the Leafs bench for Babcock. A combative series that ends in defeat would negate any–such guarantee, yet provide Dubas with minimal rationale to make a change. Only a first–round embarrassment — the Bruins prevailing in four or five games — likely ushers in a new coaching era for the Blue and White. Until I spotted photos taken in February by Mike Zeisberger of NHL.com, I didn’t realize Ian Turnbull could grin; that his facial muscles were upwardly–mobile. Not that Ian’s a rotten guy, but he’s best–remembered by those nearing senior citizenry (like me) as rather inhospitable during his nine years (1973–74 to 1981–82) playing defense for the Maple Leafs. Comportment he applied on the ice… and amid dastardly reporters. 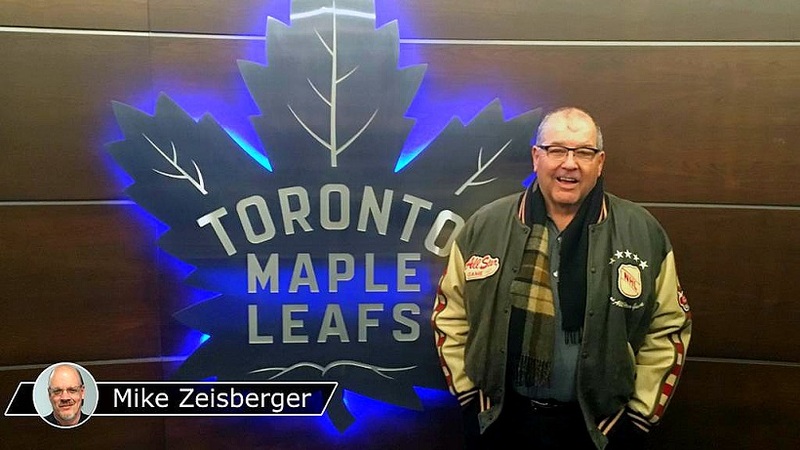 When Ian toiled for the Los Angeles Kings in the ’81–82 season — and very early in my media career — I lingered like a doormat in the visitors’ dressing room at Maple Leaf Gardens. Having approached him and requested a short interview, Ian told me, rather curtly, I’d have to wait until he stopped prattling with Global TV sportscaster Mike Anscombe. Nearly an hour later, and with Gardens’ security people wanting to lock the building for the night, Ian sauntered over and said “yeah, so whad’ya want?” Such sweetness. When I told him, however, I was hoping to obtain a few comments about Kings’ teammate Charlie Simmer, he brightened considerably. “Oh, for Charlie? Sure… anything. Go ahead.” But, still… no smile. I was therefore pleasantly surprised when I came upon the photo, below, of Turnbull accepting the J.P. Bickell Memorial Award, two months ago, at Scotiabank Arena. Notice how the right side of the mouth curves upward; the gleam in the eyes. “Oh stop… you’re a typical Toronto wag,” Ian chided on the phone from California as I needled him about looking happy. But, why wouldn’t he be? Introduced in 1953, the Bickell Award is issued periodically to “a player of the Maple Leaf hockey team, at such times and for such merit, as may be designated and determined by the Board of Directors”. Accordingly, it has been presented only 22 times in 65 years. Turnbull became the first recipient since Pat Quinn in 2003. 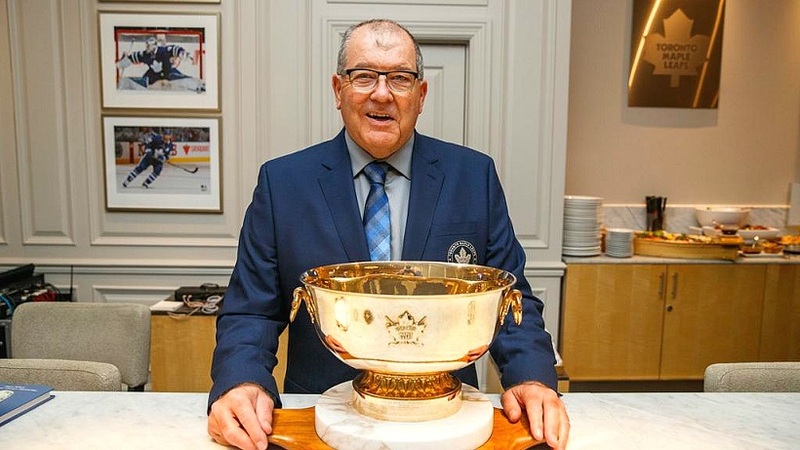 Why it required 42 years for the Leafs’ Board to recognize Ian’s accomplishments in 1977 is another question altogether. It was in the early months of that year when Turnbull established two of the more–significant records in the National Hockey League: most goals in one game by a defenseman (5) and most points in one season by a Leafs defenseman (79). Neither mark has been equaled. Turnbull erupted for his quintet of goals against Detroit at the Gardens on Feb. 2, 1977. He finished the 1976–77 schedule with 22 goals and 57 assists — his 79 points just one more than defense–mate Borje Salming. In the early stage of the current NHL season, it appeared as if Morgan Rielly would not only threaten Turnbull’s team record, but the league standard for blue–liners (139 points) crafted by Bobby Orr in 1970–71. Alas, and inevitably, Morgan tailed off and finished the regular schedule with 72 points — most by any Leaf defenseman not named Turnbull or Salming. “I met Morgan when I was up there in February — he’s a nice kid and I was pulling for him” Turnbull said. “In fact, I would have been elated for him if he had have broken the record. You notice I didn’t say ‘my’ record. I don’t ‘own’ it… or the five goals in one game. Otherwise, players today would need to ask my permission to break them. I was simply fortunate enough to establish the records back then. I would think that surpassing them is always possible. But, as time goes on, I occasionally wonder ‘will it really happen?’ I mean it’s been 42 years — nearly half–a–century. Same thing with [Darryl] Sittler’s 10 points (in one game, against Boston on Feb. 7, 1976). Or, the Leafs winning the damned Cup, for that matter (last time being 1967). Human nature would suggest that Ian might wish to hang onto his two records indefinitely. But, not so, insisted the 65–year–old. “To be honest, I couldn’t give a sh** if they’re broken one day,” he said, sounding more like the 1970’s Turnbull. “I don’t spend one second thinking about them… until someone raises the issue. But, if you’re asking me about Morgan Rielly, I would love to see it happen for the kid. 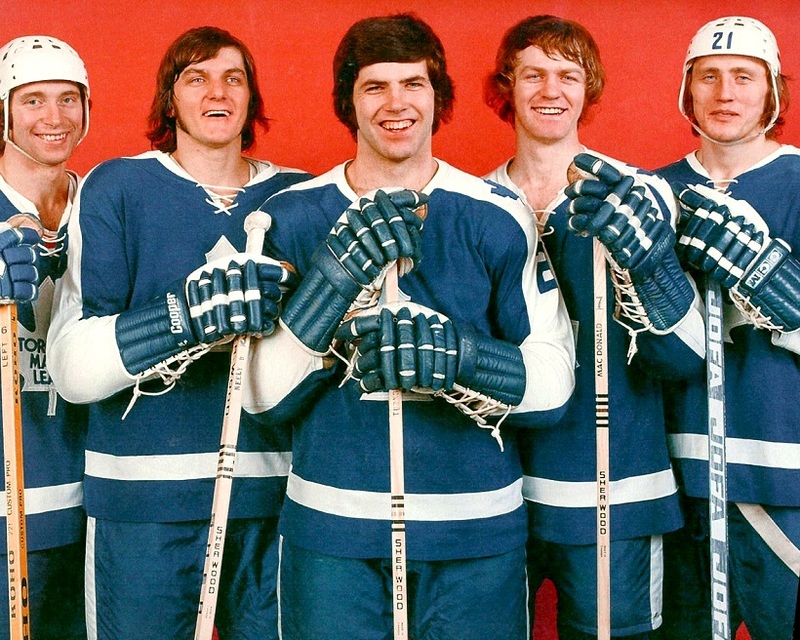 I mean, it’s not like I trounced every other defenseman on that [1976–77] team. Heck, Borje had 78 points (one fewer). It’s kind of remarkable for two guys on the same club, considering how the game has changed through the years. So, if someone like Morgan is capable of bettering the 79 points, all the power to him. I’m beyond projectile vomiting when it comes to the utterly irrational Toronto media. All this team has done for 51 years is take criticism in the media for the instability the media themselves create. It’s a never ending cycle of firing after firing and trade after trade. That kind of thing has been going on for so long it’s made it all but impossible to believe the whole thing is nothing but a game. Are reporters and pundits incapable of spotting patterns in their own behaviour? Or am I the only person who is aware that we’re all living in Groundhog Day 2 ? Sigh… someone else taking media too seriously. Good Call on Kadi Howard. He looks as sharp as Don’s Comic Book Blazer. I know it’s only been 1 period + Coaches Corner but Sweet Baby Jesus …. Toronto is playing like a Team possessed. Hallelujah. If they/we/the team can keep the level of play up in the stratosphere the bruins are going to lose their marbles.